U.S. Rep. Paul Ryan (R-WI) holds up a copy of the 2012 Republican budget proposal during a news conference April 5, 2011 on Capitol Hill in Washington, DC. Lori Montgomery writes about the negotiations that put the House GOP in its current position: Dreaming up a budget that balances in a mere 10 years, twice as quick as the old Ryan budgets. Deliciously, for lovers of the theory that the House is run by forces outside his control, the idea is credited to the Club for Growth. It goes back to the Williamsburg Compact, as I’ve just decided to name the deal that came out of the House GOP conference. [Paul] Ryan helped broker an agreement with Boehner on behalf of four conservative leaders: Rep. Steve Scalise (La. ), the chairman of the conservative Republican Study Committee, and Reps. Jeb Hensarling (Tex. ), Jim Jordan (Ohio), Tom Price (Ga.) and Steve Scalise (La. ), all past chairmen of the committee. In consultation with Club for Growth President Chris Chocola, the congressmen had been plotting a strategy for handling a series of fiscal deadlines at the beginning of 2013 in hopes of “getting conservative solutions,” Price said. But what does that mean? I asked the Club, and they pointed me to a forgotten document of the debt limit wars: The old Republican Study Committee budget. 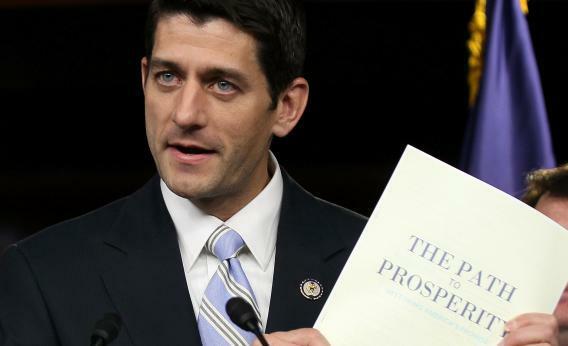 It differed from the Ryan budget in a couple of respects. First, it raised the Social Security eligibility age on a gently sliding scale—the Ryan budget didn’t touch Social Security. Second, it slashed non-defense discretionary spending back, basically, to 2008 levels. That’s larger than anything proposed by sequestration, and to Republican eyes it’s smarter because it includes some policy tweaks. (For example, welfare would be cut “once unemployment drops to 6.5%.”) Third, it included an optional tax reform that cut corporate rates to 25 percent and offered people the choice of old rates or the glory of a new, lower, two-tier rate. So conservatives think they can meet the new budget goal without further Medicare reforms—unpopoular!—but with Social Security tweaks that delight D.C. centrists and with spending cuts that voters say they crave.